Desktop FDM printers are just about everywhere nowadays. After all, they are cheap, easy to use, and give good results. However, FDM prints are not exactly known for having a high level of detail or for their quality of finish. If you want to create an object with a higher level of visual appeal, then a resin-based 3D printing technology may be just what you need. In this article, we look at how resins work to make exceptionally detailed 3D prints, briefly touch on the 3D printing technology involved, and help you choose which resin best suits your needs. In contrast to the solid filament spools that FDM uses, a 3D printer resin is a liquid solution. This liquid is basically composed of a mixture of different monomers and oligomers – short chains made mostly of carbon atoms and a few functional groups. Left in this state, they will remain in liquid form. The goal is to create longer chains using these monomers and oligomers which will eventually form the hard-plastic material for our 3D prints. How do you make these short chains come together to form longer chains? The answer lies in photopolymerization. In this process, energy from a beam of light provides enough energy for molecules at the terminal ends of monomers and oligomers to escape. This creates a charge imbalance in the monomers and oligomers, and their terminal ends are now free to react with each other. When their reactive end members come together, they start to form long polymer chains. This is not a one-step process – long polymer chains continue to form in the space of a fraction of a second. A benefit of a resin-based 3D printing method is that the “curing” step does not stop after each layer has been printed. Some of the monomers and oligomers remain at their unreacted state, leaving them open to bond with the next layer. Thus, layer adhesion in resin-based 3D printing is less of an issue than in FDM. Layers being bonded to each other at the molecular level also means that there is practically no difference in tensile strength in any of the 3 dimensions – the Z-axis tensile strength is equal to the tensile strength in the X and Y axes. There are several resin-based 3D printing methods that have been developed, and each one approaches photopolymerization in a slightly different way. However, they are all similar in that they have a holding vat for the liquid resin and a build platform that incrementally moves up or down as the print progresses. The most common method is stereolithography, or SLA. In SLA, the energy for photopolymerization is provided by a concentrated laser beam of light in the ultraviolet frequency. 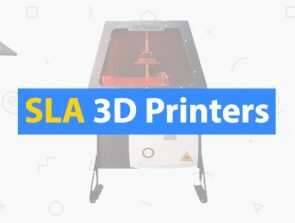 SLA printers can have a top-down or bottom-up orientation, either of which has its own advantages and disadvantages. The strength of SLA lies in its level of detail. Having a laser light sources that has a size of about 20 to 30 microns means that SLA can produce highly intricate and detailed prints. However, the ability to create high resolution 3D prints means that it will also take a longer time to finish. The light source of an SLA printer is also more expensive than the light source used for other resin-based 3D printing methods. The second most commonly used resin-based 3D printing process is Digital Light Processing, or DLP. DLP is still based on the concept of photopolymerization but uses a light projector to cure the resin layer by layer instead of a point source. 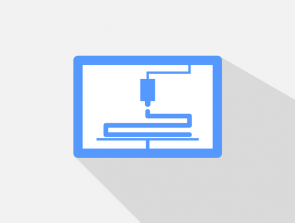 The ability to cure all points of a single layer at the same time means that DLP can print much faster than SLA for an object of the same build size. However, some details can get lost in the process so DLP is not exactly the best choice for very intricate designs. Using a projector that is only capable of a fixed number of pixels also means that a print with a larger build size will also have less detail. On the bright side, the light source for a DLP printer is much cheaper compared to the laser light source of an SLA. In summary, DLP printing is more appropriate for churning out models and prints faster when the level of detail is not much of an issue. It is also the cheaper alternative. If the goal is to create a resin-based 3D print with as much detail as possible, then SLA is the better choice. However, SLA printing is slower and more expensive. The first question you should be asking yourself when looking for resin is what are you going to be using the printed object for? Unlike FDM filaments which can be used interchangeably with each other, 3D printer resins are more specialized products. Most resins excel in one particular area. One resin may make exceptionally tough prints that have a slightly rough surface, while another resin may produce transparent prints that are not exceptionally strong. To help you choose the best 3D printer resin for you, we have listed down the most common properties of resins available in the market today. SLA and DLP prints are well-known for having a smooth finish that you can only get with FDM prints after a lot of post-processing. However, there are specialty resins that claim to create exceptionally smooth prints, even compared to other 3D printer resin products. 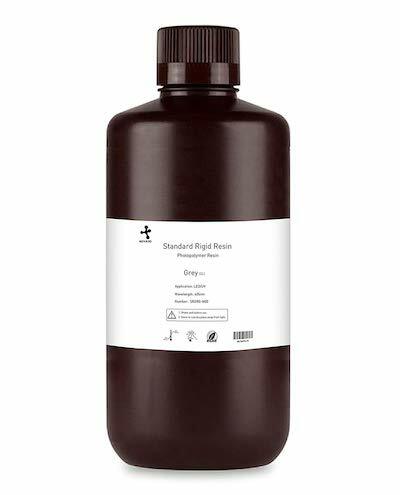 There are also some resin products that claim to be made for printing with ultra-high accuracy with minimal shrinkage. If quality of detail and smoothness of finish are your priorities in 3D printing, then you should be looking into these types of resins. Despite the excellent layer to layer adhesion of SLA and DLP prints, they are not still not exactly known for their toughness. Resin-based 3D prints are known to be brittle and are prone to fail by shattering or cracking. To address such issues, some manufacturers have produced “engineering” resins, which are customized to simulate the toughness of injection-molded plastics. There are different approaches to creating a durable resin-based print. Some resins specialize on “toughness” or having a high tensile strength and elasticity. Prints made from this type of resin are exceptionally stiff and shatter-resistant, which is perfect for functional joints or hinges. The second approach is to create a resin that specializes on flexibility. Prints made from this type of resin can deform or elongate without breaking, which makes them the material of choice for clamps and snap fits. Speaking of flexibility, some resins take it one step higher and create prints that have rubber-like properties. These materials have very low tensile modulus, very high elongation, and very high impact resistance, making them the perfect choice for objects that are meant to be bent and compressed. However, being extremely soft makes the printing process quite challenging, and you will likely have to use extensive support structures to keep the object from failing while printing. One thing to keep in mind is that although they seem rubber-like, they still do not simulate the full capabilities of rubber. They are not as durable and will still degrade after prolonged UV exposure. Much like transparent and translucent FDM filaments, there are special 3D printer resins that are made specifically to create transparent objects. The mechanical properties of objects made with clear resin are not much different compared to those made from standard resins, but they can be finished to a point where they are transparent enough to look like glass. Granted that the finishing process is also not as simple and quick as it sounds, this resin is the best choice for creating objects made to showcase the internal features of a device or for transparent display items. It must also be noted that the optical properties of such objects will also degrade with excessive UV exposure. A very useful application of SLA and DLP prints is in the manufacture of medical equipment and prostheses devices. Resin-based prints have been used to create surgical guides, orthodontic implants, hard splints, and dental retainers. The high level of detail of SLA printers has allowed medical personnel to create devices and implants that are tailor-made to specific patients. Specialty resins used for such applications must be able to maintain chemical and structural stability even when in prolonged contact with skin, open wounds, or bodily fluids. They must also be fracture-resistant and wear-resistant. Thermal stability is also a requirement, since these medical devices will likely have to undergo high temperature sterilization possibly for several times within their useful life. Printing with resins is generally more expensive than printing with filaments. The design of a typical SLA printer also requires that you have enough liquid resin to fill the whole resin vat as the build platform needs to be completely submerged. Where you can buy an entire roll of filament for about $20, a liter of good-quality 3D printer resin can cost at least $50. Depending on your specific application, specialty resins can cost up to $200 per liter. 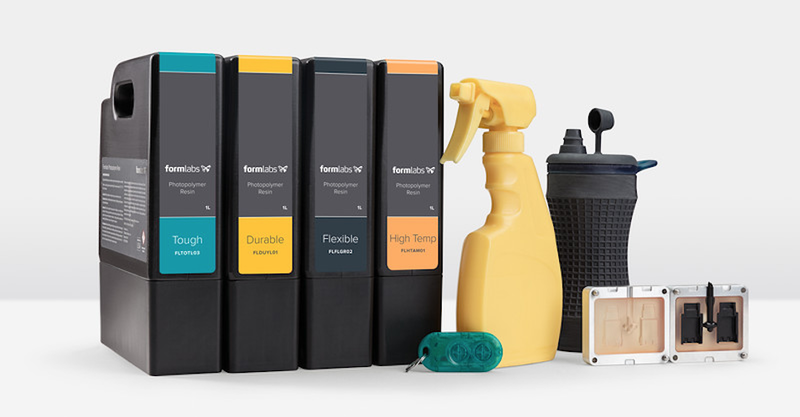 What are the best 3D printer resins today? As you can see, choosing the best 3D printer resin is a matter of application type and cost. We have summarized below the most popular and best performing brands of 3D printer resins that are currently available in the market. 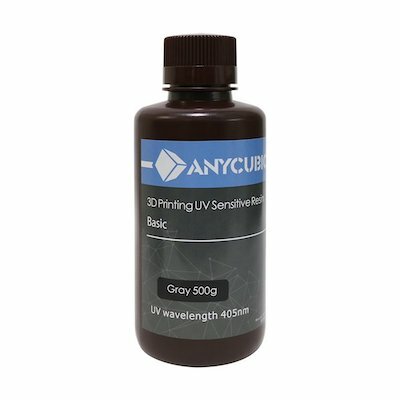 Anycubic offers their liquid resin product in a huge variety of colors including blue, red, maroon, and yellow. They also have a dental castable option. Each variety can be purchased in either 500 mL or 1 L bottles. Anycubis is THE brand of liquid resins for 3D printing, with their products being the most popular today. Prints made from the Anycubic liquid resins come out with a very smooth finish. The material allows for high precision detailing due to its dimensional stability and low shrinkage. Combined with its very vibrant colors, prints made from Anycubic can achieve a very high level of aesthetic value. The formulation of this resin was made specifically to allow quick curing, allowing you to shorten the printing time and curing time. Prints made from the Anycubic resin have a good combination of toughness and durability. Using the liquid resin can be quite challenging for beginners, but Anycubic provides constant technical support via their Facebook page. In particular, starter settings for any type of resin are made available for the most popular models of desktop resin printers. The product was made specifically to be cured by an LCD light source, which should guarantee better printing quality. Monoprice offers their liquid resin products in several vibrant colors, plus a clear option. It is slightly more affordable per liter, and the resin can be purchased in smaller increments of 250 mL, 500 mL, and 1 L bottles. It is compatible for all types of resin printers – SLA, DLP, or LCD. It was specifically designed to be cured by a low power UV source, although most users have reported getting better results by stretching the exposure time. Feedback on the Monoprice resin has been generally positive, with most users getting successful results out of it. Adhesion to the build plate has been cited as exceptionally good, which is very important for the typical bottom-up desktop SLA printers. In any case, Monoprice promises extensive technical support for their products before and after sale. The liquid resin from NOVA3D is available in a small range of colors, also with a clear option, and can be purchased in 500 mL and 1 L bottles. They can be used for UV curing, or for LCD and DLP printers. Their sales page helpfully details their recommended printer settings, with figures for the curing time and the wavelength of incident light. Prints made from the NOVA3D resin are exceptionally resistant to deformation which should give you the ability to print thin walls that most other resins cannot. Having a low shrinkage factor also means that prints will come out with higher accuracy and better detail. The toughness, flexibility, and impact resistance of prints made from this resin are at par with most other resin products in the market. This resin is slightly more expensive than the previous resin product we have reviewed, but we like how this resin created very clean and detailed prints. In terms of quality, NOVA3D resins can rival the higher end and more popular Anycubic resins. 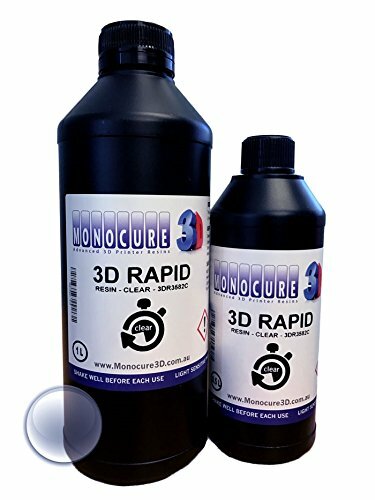 Monocure 3D offers their resin products in a small range of colors, with bottles of 500 mL, 1L, and supersized 5L options. True to the name, the Rapid Resin line is made for curing with a low powered LED light source, and the curing time is around 4 times shorter than the standard resin. The quality of prints made using this resin will not leave you wanting despite the amount of time that you will end up saving. The details are superb, and the finish is as smooth as any other resin with a standard curing time. Perhaps the only complaint with the Monocure 3D resin is the strong odor that it releases during curing. 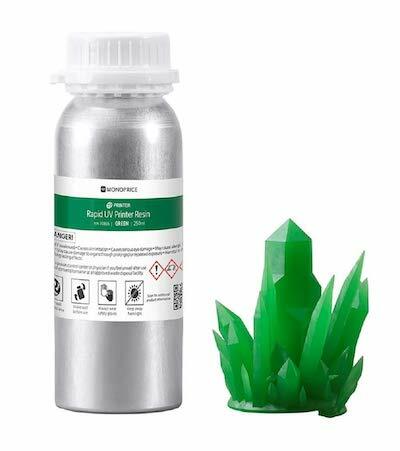 Make sure you are in a well-ventilated area when printing using this liquid resin. In any case, the shortened curing time should more than make up for this disadvantage. The liquid resin from Sparkmaker does not come with fancy color but they make up for it by offering specialty resins such as tough, elastic, clear, nylon-like, and castable. The resins are only offered in 500g bottles. Being specialty resins, they are also more expensive on a per liter rate. This clear resin variety boasts of producing a great finish on top of having durability that is comparable to ABS. Even though this product is branded as being an SLA resin, it can be used just as well with a DLP printer. It has a low odor which should make the printing process more pleasant. 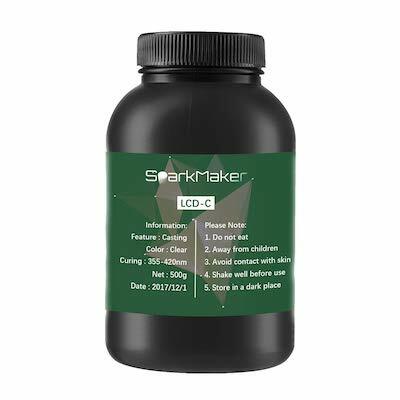 Even though Sparkmaker does not sell this resin in any other color variant, it can be mixed with any color pigmentation compound to make colored prints. 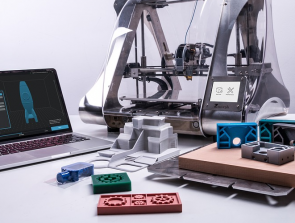 Even though resin-based printing has not caught on in the same way that FDM has, there is no denying that there is potential for this technology. SLA or DLP printing creates objects at a level of detail and finish quality that FDM just cannot attain, giving it a niche in the market. Right now, printing with resins is still quite expensive, both in terms of the printers and the resins. Still, a market demand for this technology can only mean that it will continue to evolve and improve. In the near future, it is not unreasonable to expect desktop SLA printers to become as affordable and as common as desktop FDM printers. 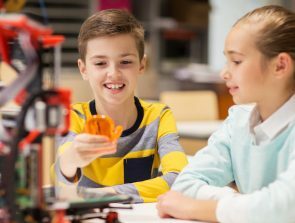 When that time comes, 3D printing will open into a whole new dimension, and we cannot help but be excited for the possibilities.